This Central Coast vacation and travel guide will introduce you to the coastal region of California located between the San Francisco Bay Area and Los Angeles. While this region is perhaps best known for its stunning Highway 1 coastline vistas, it also offers abundant opportunities to enjoy “the good life” – invigorating outdoor adventures, award-winning wines and you-really-can’t-get-any-fresher-than-this foodstuffs from land and sea. 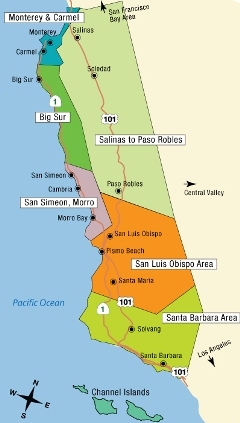 From the world-famous Monterey aquarium and Carmel’s scenic 17-Mile Drive, to Big Sur (for which adjectives seem somehow inadequate), the Hearst Castle, the Paso Robles wine country, Solvang’s little piece of Denmark, Santa Barbara’s “American Riviera” and all the way out to the unspoiled wilderness of the Channel Islands National Park, there’s really nothing like this piece of the California coastline. A unique feature of the Caliornia Central Coast is year-round whale watching opportunities available in the Santa Barbara area. From December through mid-February, Gray Whales traverse these waters on their southern migration and then they head back north from mid-February through the end of April. Additionally, from May to November, large pods of giant Blue and friendly Humpback Whales feed in the nutrient-rich waters between the coast and the Channel Islands, and there are many boat-tour operators in the area to assist your viewing and enjoyment of these incredible creatures. Another much smaller creature that returns again and again to a few different Central Coast locales (as well as other coastal areas in the state) is the Monarch Butterfly. They gravitate to Pacific Grove (near Monterey), Andrew Molera State Park (about 20 miles south of Carmel) and Pismo Beach (near San Luis Obispo) among other places, arriving in October/November and leaving the following January/February. There is much to enjoy – both outdoors and indoors – and you’ll learn about some of the best California has to offer in this Central Coast vacation and travel guide. There’s also a Museum of Natural History at Morro Bay State Park (from which the famous Morro Rock can be seen), and another bit of history – this time the Central Coast’s railroad heritage – is preserved at the Santa Maria Valley Railway History Museum.